For many families the Thanksgiving tradition goes far beyond a traditional turkey meal with family members gathering from all over town to express their gratitude. 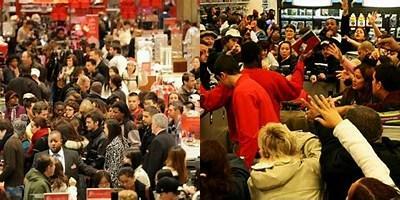 Instead, Thanksgiving means getting past the turkey food coma to wait in line to snag the best Black Friday deals. It’s estimated that in 2016, 101.7 million people braved the crowds to grab their long-awaited discounts. It’s always puzzling to me to that the busiest shopping day would be after a holiday designated for gratitude and family gatherings. Every year I hear stories on the news about lines circling around buildings, people getting trampled on, and fights being broken up at the wee hours of the night. It’s as if Thanksgiving did not happen a few hours before as people fight for material possessions, pushing anyone aside to get their bargains. Today’s passage talks about a religion that our Father accepts as pure as one that looks after the marginalized. We see that on the top of God’s priority is for His children to take care of those in need. While it may be easy to dismiss the problem of homelessness, hunger, and poverty as a problem too big for us to solve, God highlights throughout Scripture our call to bring, not only spiritual revival for others, but physical as well. We are called to be the light of the world in every situation by serving God’s children in all areas of need. In America, while 101 million people wait in lines during Black Friday every year, about 40 million people face hunger every day. If every person who goes shopping on Friday serves one person who may not have the opportunity to enjoy a holiday meal, we could provide a Thanksgiving meal for two years. While I am not saying discount shopping is bad, let’s remember that God calls us to look after those in need. Can I encourage you this Black Friday to continue in a heart of gratitude by serving someone who may be in need it? It can be as simple as blessing a retailer worker who missed Thanksgiving to work, donating to a local food pantry, or using the money you saved for Black Friday shopping on someone in need. Whatever it is, may we, in Thanksgiving, be a light to those who are in need. Prayer: God I thank You for Your constant provision in my life. Help me to be a light to those who need it most this season. May I be able to inconvenience myself to serve those who may be less fortunate. In Jesus name. Amen. Read Philippians 2:5-8: In your relationships with one another, have the same mindset as Christ Jesus: 6 Who, being in very nature God, did not consider equality with God something to be used to his own advantage; 7 rather, he made himself nothing by taking the very nature of a servant, being made in human likeness. 8 And being found in appearance as a man, he humbled himself by becoming obedient to death—even death on a cross! What attitude should we have while serving others? How did Jesus model the attitude of service we should have? List some practical ways that you can serve someone today. We should have an attitude of humility, like Jesus. Jesus modeled a life of humility and service by coming into the world to face death for the sins of the world. This morning we discussed a religion that God deems pure and faultless as one that looks after the marginalized. We reviewed in the afternoon, Jesus’s life as the greatest testimony of service to the marginalized when he faced death on the cross for sinners. How did you do in being a humble servant today? Were you able to help someone in need, pray for someone who may be struggling, or give what you have to those less fortunate? Tomorrow is a new day, but remember Christianity is called to be a religion that helps those in need.